They say an image is worth 1,000 words, and that the camera never lies. In Matt Henry‘s new photographic book, Short Stories, these hypotheses are tested to the limit. Each of the scenes displayed in this beautiful and unsettling book offers countless possible narratives. Cast in vivid sun-drenched technicolour, they sing shrilly of a far earlier era, and yet each was snapped sometime between 2007 and 2015. Even more unexpected, the majority were staged on UK soil with a cast of actors and friends playing the characters apparently caught while going about their everyday lives. Powerfully, it suggests, the American Dream really is an illusion. There’s so much happening in each of the scenes – even empty rooms ripple with a sense of anticipation. Paranoia and hope sizzle with equal emphasis, suggesting that drama awaits at the every corner – and the direction each life will take could rest in the spin of a nickel. Any writer who can imbue their work with such palpable tension will be a master of their art. 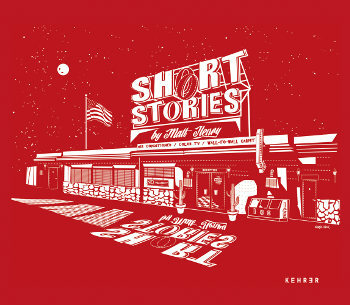 Short Stories by Matt Henry is published by Kehrer Verlag and is available to buy from www.artbooksheidelberg.com or from www.matthenryphoto.com. This entry was posted in Writing tools and tagged Matt Henry, photography, short stories by Judy. Bookmark the permalink.